Something I've long meant to post about—and isn't news at all—is the fact that there is a lost lake in the basement of the Empire State Building. Or a pond, more accurately speaking. After following a series of links leading off from Steve Duncan's ongoing exploration of New York's "lost streams, kills, rivers, brooks, ponds, lakes, burns, brakes, and springs," I found the fascinating story of Sunfish Pond, a "lovely little body of water" at the corner of what is now 31st Street and Fourth Avenue. "The pond was fed both by springs and by a brook which also carried its overflow down to the East River at Kip's Bay." Interestingly, although the pond proper would miss the foundations of the Empire State Building, its feeder streams still pose a flood risk to the building, rising up through the concrete during heavy storms. To a certain extent, this reminds me of a line from the recent book Alphaville: "Heat lightning cackles above the Brooklyn skyline and her message is clear: 'You may have it paved over, but it's still a swamp.'" That is, the city can't escape its hydrology. But perhaps this makes the Empire State Building as good a place as any for us to test out the possibility of fishing in the basements of Manhattan: break in, air-hammer some holes through the concrete, bust out fishing rods, and spend the night hauling inexplicable marine life out of the deep and gurgling darkness below. I heard that Peter Stuyvesant's canal is still leaking into the Canal Street subway stations. nice post, but you might be off by a few blocks. 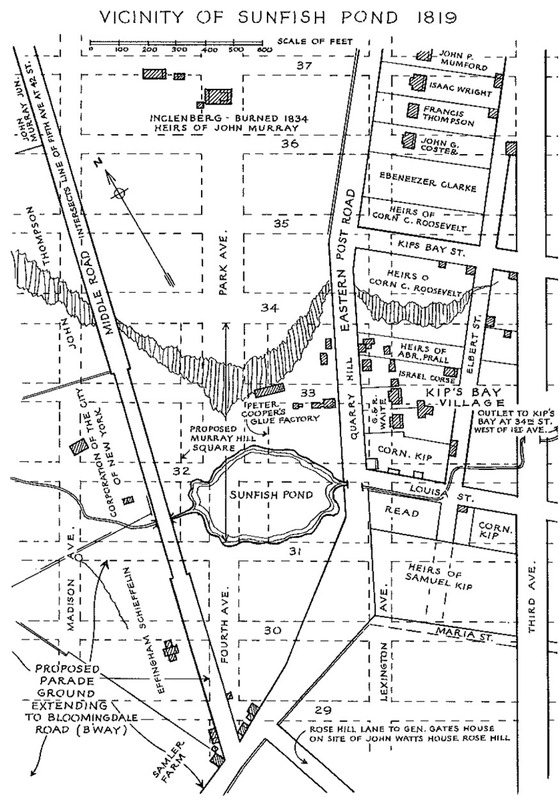 what is on that map labeled "fourth avenue" is today called park avenue. the ESB is west of fifth. Your notion of fishing in the basements reminds me of the Basilica Cisterns in Istanbul. Built after 532, it was rediscovered in the 16th century after Petrus Gyllius was curious about people getting water and fishing through holes in their basement. THAT'S NOT WHERE THE EMPIRE STATE BUILDING IS! That's where the Lexington Plaza is. Empire State Building is 5th and 33-34 St.